The results are available from Targetcraft Archers 11th Annual Record Status WA18m Tournament, which took place on Sunday 17th Feruary 2019. This shoot is part of the 2018/19 Chris Mason Celebration League. The current standings will be updated asap. The results are already available from Wellingborough OAC’s Jim McKeown Memorial Shoot, held on Saturday 9th February 2019. This shoot is a part of the 2018/19 Chris Mason Celelbration League, which will be updated asap. The Results are now available from Archers of Raunds 41st Open Portsmouth Tournament, on Sunday 27th January 2019. This shoot is part of the 2018/19 NCAS Chris Mason Celebration League. The current standings have been updated with these results. The results are now available from Targetcraft Archers 12th Annual Record Status Portsmouth Tournament, which took place on Sunday 2nd December 2018. This shoot is part of the NCAS Chris Mason Celebration League. 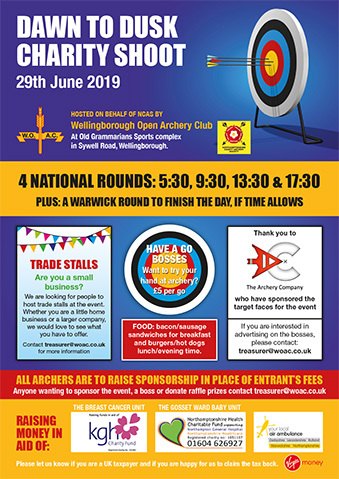 The results are now available from Wellingborough OAC’s Indoor Open Tournament, which took place on 10th November 2018.